There are a lot of options when choosing a shell for conversion. We don’t claim to have made the best choice, but we feel very strongly that we made the right choice for us. A lot of factors were considered when choosing our wheels. Some of these included cost and availability on the market, but a lot of the factors concerned resale value and a sense of security going down the road. What we didn’t want to get into was a vehicle we couldn’t rely on that would end up being a liability and money drain instead of the adventure mobile we dreamed of. We found a few options on the market that ticked the boxes on our list, such as, the ability to stand up inside. Ultimately, we chose to make a sacrifice on our original budget to purchase a gently-used Ford Transit 250 with a high roof and low mileage. In hindsight, the extended version would have given us a couple more feet of room inside. That said, you can’t miss what you don’t have and we’ve made it work for us. Ford dealerships are really abundant and the cost of maintenance and repairs are far more reasonable than that of a luxury brand. Ford is notorious for their excellent customer service and the few times we’ve needed to visit a dealership, we’ve been absolutely blown away. Going down the road, we like that there is still a little bit of warranty on our side, just in case. Above all, the gamble of “will I have to replace a $10,000 engine today?” being off the table, is definitely our favourite perk. A Promaster would have also been a good option for us, and we rejected it purely on it’s funky aesthetic and the fact that most of the local market consisted of vehicles that had seen a lot of abuse. Eventually, you have to make a choice and take the financial plunge. Whatever you choose is entirely personal and entirely ok. Just be educated on your wants vs. your needs and be sure it will serve its purpose - keeping you on the road, getting you where you want to go, securely holding the gear you intend to use, and keeping you alive at 100 Km/hr. Just as important, what do you see yourself doing on this big adventure? We needed space for our mountain bikes, camping equipment, a snowboard, two longboards, three kinds of helmets, camera equipment, and four seasons of clothing and footwear. We also needed to store our utilities inside to avoid issues in the cold winter months. We measured and sketched and taped until we had our final design: A fixed bed ten inches short of a queen, a big garage for equipment and utilities, a galley kitchen with a built-in fridge, and a bench to store our composting toilet (hahaha never mind, we need the storage space for laundry) and to serve as a step up to the bed. 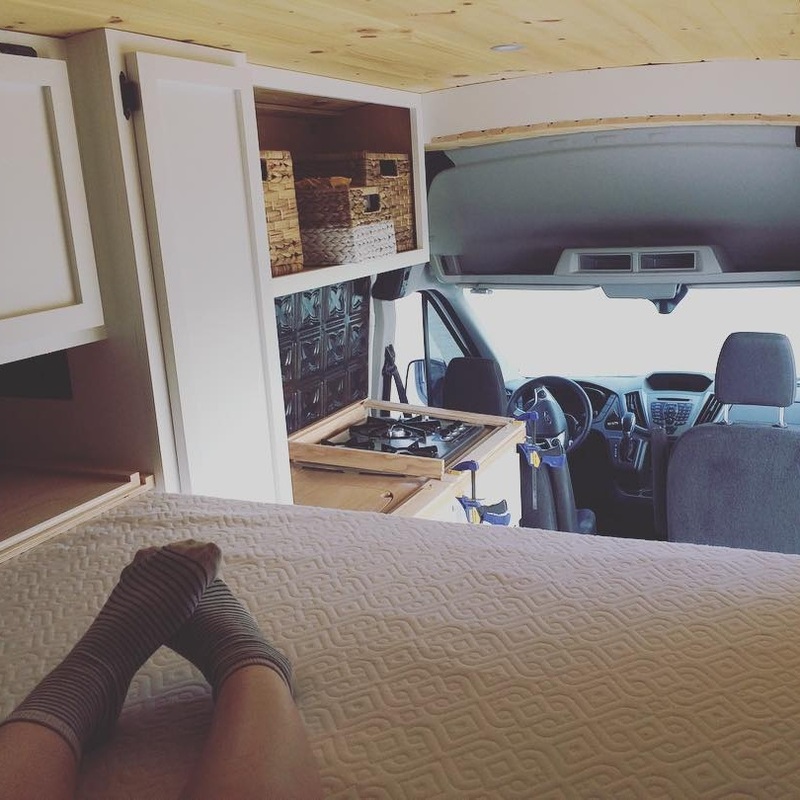 The final result was a tiny 66 square-foot micro house on wheels, just big enough to get some sleep, cook a meal, make a cup of coffee, and haul our toys, tools, and bare necessities.